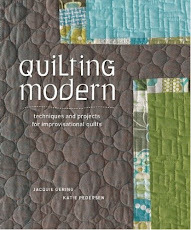 Several guild members took a workshop with Jacquie and I really enjoyed her style and quickly bought this book to learn more about it. The first 45 pages are full of wonderful tips and tricks and philosophy about quilt design, color, caring for your fabric (all excellent for this novice quilter). I am working on a scrappy string quilt to get the idea of how to do this, and definitely plan on making a fractured quilt. Fiesta Wall Hanging. One of the things I love about this book, and hope to grow into, is the ideas of quilts using negative space more, so many of the designs pop in here because they are not taking up too much fabric real estate. In my opinion, this book is a must have for your library.